Proprietary Name: Anastrozole What is the Proprietary Name? Non-Proprietary Name: Anastrozole Tablets What is the Non-Proprietary Name? 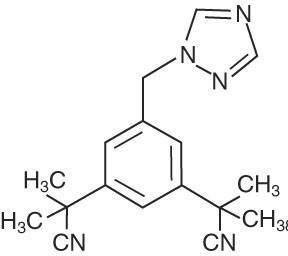 69117 - Yiling Pharmaceutical, Inc.
Anastrozole with NDC 69117-0003 is a a human prescription drug product labeled by Yiling Pharmaceutical, Inc.. The generic name of Anastrozole is anastrozole tablets. The product's dosage form is tablet and is administered via oral form. Labeler Name: Yiling Pharmaceutical, Inc.
FDA Application Number: ANDA206037 What is the FDA Application Number? Anastrozole is indicated for adjuvant treatment of postmenopausal women with hormone receptor-positive early breast cancer. Anastrozole is indicated for the first-line treatment of postmenopausal women with hormone receptor-positive or hormone receptor unknown locally advanced or metastatic breast cancer. 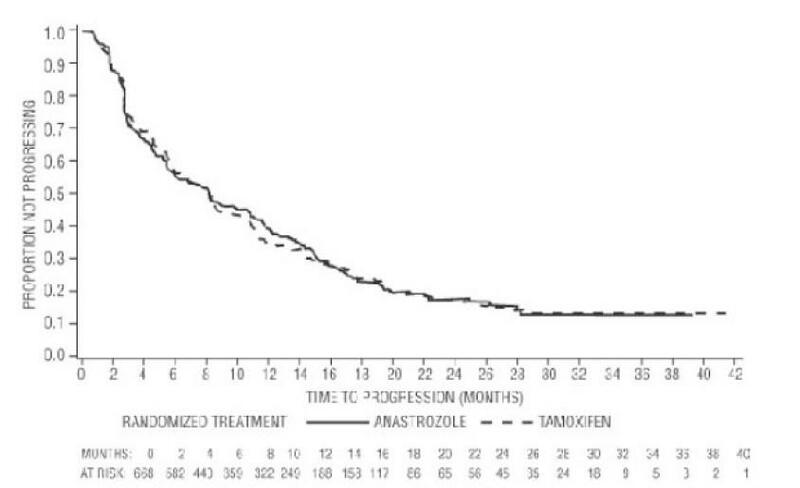 Anastrozole is indicated for the treatment of advanced breast cancer in postmenopausal women with disease progression following tamoxifen therapy. Patients with ER-negative disease and patients who did not respond to previous tamoxifen therapy rarely responded to Anastrozole. Use in Specific Populations (8.6)]. 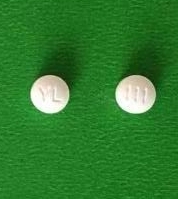 Anastrozole Tablets, USP 1 mg are white, circular, biconvex tablets, debossed with ‘111’ on one side, and ‘YL’ on the other side. Use in Specific Populations (8.1)]. During the ATAC trial, more patients receiving Anastrozole were reported to have elevated serum cholesterol compared to patients receiving tamoxifen (9% versus 3.5%, respectively) [see Adverse Reactions (6.1)]. Common adverse reactions (occurring with an incidence of ≥10%) in women taking Anastrozole included: hot flashes, asthenia, arthritis, pain, arthralgia, hypertension, depression, nausea and vomiting, rash, osteoporosis, fractures, back pain, insomnia, headache, bone pain, peripheral edema, increased cough, dyspnea, pharyngitis and lymphedema.In the ATAC trial, the most common reported adverse reaction (>0.1%) leading to discontinuation of therapy for both treatment groups was hot flashes, although there were fewer patients who discontinued therapy as a result of hot flashes in the Anastrozole group.Because clinical trials are conducted under widely varying conditions, adverse reaction rates observed in the clinical trials of a drug cannot be directly compared to rates in the clinical trials of another drug and may not reflect the rates observed in practice. Clinical Studies (14.1)]. The median duration of adjuvant treatment for safety evaluation was 59.8 months and 59.6 months for patients receiving Anastrozole 1 mg and tamoxifen 20 mg, respectively. Adverse reactions occurring with an incidence of at least 5% in either treatment group during treatment or within 14 days of the end of treatment are presented in Table 1.Table 1 — Adverse reactions occurring with an incidence of at least 5% in either treatment group during treatment, or within 14 days of the end of treatment in the ATAC trial *Body system and adverse reactions byCOSTART† preferred term ‡Anastrozole 1 mg(N§= 3092)Tamoxifen 20 mg(N§ = 3094)Body as a wholeAsthenia575 (19)544 (18)Pain533 (17)485 (16)Back pain321 (10)309 (10)Headache314 (10)249 (8)Abdominal pain271 (9)276 (9)Infection285 (9)276 (9)Accidental injury311 (10)303 (10)Flu syndrome175 (6)195 (6)Chest pain200 (7)150 (5)Neoplasm162 (5)144 (5)Cyst138 (5)162 (5)CardiovascularVasodilatation1104 (36)1264 (41)Hypertension402 (13)349 (11)DigestiveNausea343 (11)335 (11)Constipation249 (8)252 (8)Diarrhea265 (9)216 (7)Dyspepsia206 (7)169 (6)Gastrointestinal disorder210 (7)158 (5)Hemic and lymphaticLymphedema304 (10)341 (11)Anemia113 (4)159 (5)Metabolic and nutritionalPeripheral edema311 (10)343 (11)Weight gain285 (9)274 (9)Hypercholesterolemia278 (9)108 (3.5)MusculoskeletalArthritis512 (17)445 (14)Arthralgia467 (15)344 (11)Osteoporosis325 (11)226 (7)Fracture315 (10)209 (7)Bone pain201 (7)185 (6)Arthrosis207 (7)156 (5)Joint Disorder184 (6)160 (5)Myalgia179 (6)160 (5)Nervous systemDepression413 (13)382 (12)Insomnia309 (10)281 (9)Dizziness236 (8)234 (8)Anxiety195 (6)180 (6)Paresthesia215 (7)145 (5)RespiratoryPharyngitis443 (14)422 (14)Cough increased261 (8)287 (9)Dyspnea234 (8)237 (8)Sinusitis184 (6)159 (5)Bronchitis167 (5)153 (5)Skin and appendagesRash333 (11)387 (13)Sweating145 (5)177 (6)Special SensesCataract Specified182 (6)213 (7)UrogenitalLeukorrhea86 (3)286 (9)Urinary tract infection244 (8)313 (10)Breast pain251 (8)169 (6)Breast Neoplasm164 (5)139 (5)Vulvovaginitis194 (6)150 (5)Vaginal Hemorrhage¶122 (4)180 (6)Vaginitis125 (4)158 (5)*The combination arm was discontinued due to lack of efficacy benefit at 33 months of follow-up.†COSTART Coding Symbols for Thesaurus of Adverse Reaction Terms.‡A patient may have had more than 1 adverse reaction, including more than 1 adverse reaction in the same body system.§N=Number of patients receiving the treatment.¶Vaginal Hemorrhage without further diagnosis.Certain adverse reactions and combinations of adverse reactions were prospectively specified for analysis, based on the known pharmacologic properties and side effect profiles of the two drugs (see Table 2).Table 2 — Number of Patients with Pre-specified Adverse Reactions in ATAC Trial*AnastrozoleN= 3092 (%)TamoxifenN=3094(%)Odds-ratio95% CIHot Flashes1104 (36)1264 (41)0.800.73 - 0.89Musculoskeletal Events†1100 (36)911 (29)1.321.19 - 1.47Fatigue/Asthenia575 (19)544 (18)1.070.94 - 1.22Mood Disturbances597 (19)554 (18)1.100.97 - 1.25Nausea and Vomiting393 (13)384 (12)1.030.88 - 1.19All Fractures315 (10)209 (7)1.571.30 - 1.88Fractures of Spine, Hip, or Wrist133 (4)91 (3)1.481.13 - 1.95Wrist/Colles’ fractures67 (2)50 (2)Spine fractures43 (1)22 (1)Hip fractures28 (1)26 (1)Cataracts182 (6)213 (7)0.850.69 - 1.04Vaginal Bleeding167 (5)317 (10)0.500.41 - 0.61Ischemic Cardiovascular Disease127 (4)104 (3)1.230.95 - 1.60Vaginal Discharge109 (4)408 (13)0.240.19 - 0.30Venous Thromboembolic events87 (3)140 (5)0.610.47 - 0.80Deep Venous Thromboembolic Events48 (2)74 (2)0.640.45 - 0.93Ischemic Cerebrovascular Event62 (2)88 (3)0.700.50 - 0.97Endometrial Cancer‡4 (0.2)13 (0.6)0.310.10 - 0.94*Patients with multiple events in the same category are counted only once in that category.†Refers to joint symptoms, including joint disorder, arthritis, arthrosis and arthralgia.‡Percentages calculated based upon the numbers of patients with an intact uterus at baselineIschemic Cardiovascular EventsBetween treatment arms in the overall population of 6186 patients, there was no statistical difference in ischemic cardiovascular events (4% Anastrozole vs. 3% tamoxifen). In the overall population, angina pectoris was reported in 71/3092 (2.3%) patients in the Anastrozole arm and 51/3094 (1.6%) patients in the tamoxifen arm; myocardial infarction was reported in 37/3092 (1.2%) patients in the Anastrozole arm and 34/3094 (1.1%) patients in the tamoxifen arm.In women with pre-existing ischemic heart disease 465/6186 (7.5%), the incidence of ischemic cardiovascular events was 17% in patients on Anastrozole and 10% in patients on tamoxifen. In this patient population, angina pectoris was reported in 25/216 (11.6%) patients receiving Anastrozole and 13/249 (5.2%) patients receiving tamoxifen; myocardial infarction was reported in 2/216 (0.9%) patients receiving Anastrozole and 8/249 (3.2%) patients receiving tamoxifen.Bone Mineral Density FindingsResults from the ATAC trial bone substudy at 12 and 24 months demonstrated that patients receiving Anastrozole had a mean decrease in both lumbar spine and total hip bone mineral density (BMD) compared to baseline. 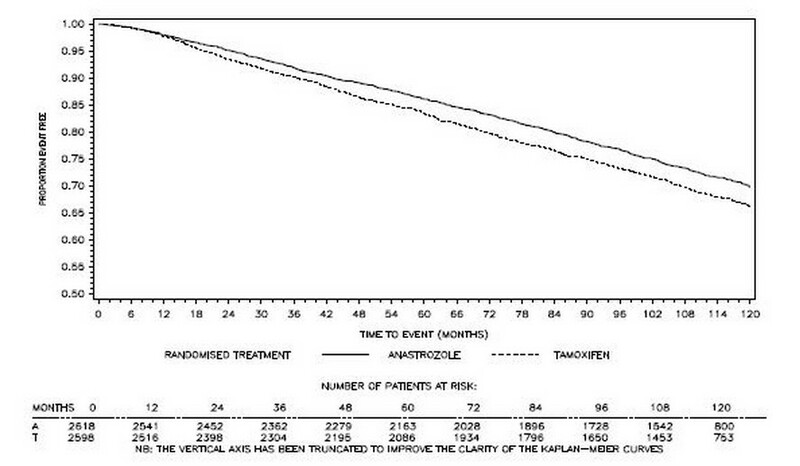 Patients receiving tamoxifen had a mean increase in both lumbar spine and total hip BMD compared to baseline.Because Anastrozole lowers circulating estrogen levels it may cause a reduction in bone mineral density.A post-marketing trial assessed the combined effects of Anastrozole and the bisphosphonate risedronate on changes from baseline in BMD and markers of bone resorption and formation in postmenopausal women with hormone receptor-positive early breast cancer. All patients received calcium and vitamin D supplementation. At 12 months, small reductions in lumbar spine bone mineral density were noted in patients not receiving bisphosphonates. Bisphosphonate treatment preserved bone density in most patients at risk of fracture.Postmenopausal women with early breast cancer scheduled to be treated with Anastrozole should have their bone status managed according to treatment guidelines already available for postmenopausal women at similar risk of fragility fracture.CholesterolDuring the ATAC trial, more patients receiving Anastrozole were reported to have an elevated serum cholesterol compared to patients receiving tamoxifen (9% versus 3.5%, respectively).A post-marketing trial also evaluated any potential effects of Anastrozole on lipid profile. In the primary analysis population for lipids (Anastrozole alone), there was no clinically significant change in LDL-C from baseline to 12 months and HDL-C from baseline to 12 months.In secondary population for lipids (Anastrozole +risedronate), there also was no clinically significant change in LDL-C and HDL-C from baseline to 12 months.In both populations for lipids, there was no clinically significant difference in total cholesterol (TC) or serum triglycerides (TG) at 12 months compared with baseline.In this trial, treatment for 12 months with Anastrozole alone had a neutral effect on lipid profile. Combination treatment with Anastrozole and risedronate also had a neutral effect on lipid profile.The trial provides evidence that postmenopausal women with early breast cancer scheduled to be treated with Anastrozole should be managed using the current National Cholesterol Education Program guidelines for cardiovascular risk-based management of individual patients with LDL elevations.Other Adverse ReactionsPatients receiving Anastrozole had an increase in joint disorders (including arthritis, arthrosis and arthralgia) compared with patients receiving tamoxifen. Patients receiving Anastrozole had an increase in the incidence of all fractures (specifically fractures of spine, hip and wrist) [315 (10%)] compared with patients receiving tamoxifen [209 (7%)].Patients receiving Anastrozole had a higher incidence of carpal tunnel syndrome [78 (2.5%)] compared with patients receiving tamoxifen [22 (0.7%)].Vaginal bleeding occurred more frequently in the tamoxifen-treated patients versus the Anastrozole -treated patients 317 (10%) versus 167 (5%), respectively.Patients receiving Anastrozole had a lower incidence of hot flashes, vaginal bleeding, vaginal discharge, endometrial cancer, venous thromboembolic events and ischemic cerebrovascular events compared with patients receiving tamoxifen.10-year median follow-up Safety Results from the ATAC Trial Results are consistent with the previous analyses.Serious adverse reactions were similar between Anastrozole (50%) and tamoxifen (51%).Cardiovascular events were consistent with the known safety profiles of Anastrozole and tamoxifen.The cumulative incidences of all first fractures (both serious and non-serious, occurring either during or after treatment) was higher in the Anastrozole group (15%) compared to the tamoxifen group (11%). This increased first fracture rate during treatment did not continue in the post-treatment follow-up period.The cumulative incidence of new primary cancers was similar in the Anastrozole group (13.7%) compared to the tamoxifen group (13.9%). Consistent with the previous analyses, endometrial cancer was higher in the tamoxifen group (0.8%) compared to the Anastrozole group (0.2%).The overall number of deaths (during or off-trial treatment) was similar between the treatment groups. There were more deaths related to breast cancer in the tamoxifen than in theAnastrozole treatment group. Adverse reactions occurring with an incidence of at least 5% in either treatment group of trials 0030 and 0027 during or within 2 weeks of the end of treatment are shown in Table 3.Table 3 – Adverse Reactions Occurring with an Incidence of at Least 5% in Trials 0030 and 0027Body systemAdverse Reaction*Number (%) of subjectsANASTROZOLE(N=506)Tamoxifen(N=511)Whole bodyAsthenia83 (16)81 (16)Pain70 (14)73 (14)Back pain60 (12)68 (13)Headache47 (9)40 (8)Abdominal pain40 (8)38 (7)Chest pain37 (7)37 (7)Flu syndrome35 (7)30 (6)Pelvic pain23 (5)30 (6)CardiovascularVasodilation128 (25)106 (21)Hypertension25 (5)36 (7)DigestiveNausea94 (19)106 (21)Constipation47 (9)66 (13)Diarrhea40 (8)33 (6)Vomiting38 (8)36 (7)Anorexia26 (5)46 (9)Metabolic and NutritionalPeripheral edema51 (10)41 (8)MusculoskeletalBone pain54 (11)52 (10)NervousDizziness30 (6)22 (4)Insomnia30 (6)38 (7)Depression23 (5)32 (6)Hypertonia16 (3)26 (5)RespiratoryCough increased55 (11)52 (10)Dyspnea51 (10)47 (9)Pharyngitis49 (10)68 (13)Skin and appendagesRash38 (8)34 (8)UrogenitalLeukorrhea9 (2)31 (6)*A patient may have had more than 1 adverse event.Less frequent adverse experiences reported in patients receiving Anastrozole1 mg in either Trial 0030 or Trial 0027 were similar to those reported for second-line therapy.Based on results from second-line therapy and the established safety profile of tamoxifen, the incidences of 9 pre-specified adverse event categories potentially causally related to one or both of the therapies because of their pharmacology were statistically analyzed. No significant differences were seen between treatment groups.Table 4 – Number of Patients with Pre-specified Adverse Reactions in Trials 0030 and 0027Number (n) and Percentage of PatientsAdverse Reaction*ANASTROZOLE1 mg(N=506)n (%)NOLVADEX20 mg(N=511)n (%)Depression23 (5)32 (6)Tumor Flare15 (3)18 (4)Thromboembolic Disease†18 (4)33 (6)Venous†515Coronary and Cerebral‡1319Gastrointestinal Disturbance170 (34)196 (38)Hot Flushes134 (26)118 (23)Vaginal Dryness9 (2)3 (1)Lethargy6 (1)15 (3)Vaginal Bleeding5 (1)11 (2)Weight Gain11 (2)8 (2)*A patient may have had more than 1 adverse reaction.†Includes pulmonary embolus, thrombophlebitis, retinal vein thrombosis.‡Includes myocardial infarction, myocardial ischemia, angina pectoris, cerebrovascular accident,cerebral ischemia and cerebral infarct. Clinical Studies (14.1)]. Based on clinical and pharmacokinetic results from the ATAC trial, tamoxifen should not be administered with anastrozole. Estrogen-containing therapies should not be used with Anastrozole as they may diminish its pharmacological action. max and AUC) and anticoagulant activity (as measured by prothrombin time, activated partial thromboplastin time, and thrombin time) of both R- and S-warfarin. Animal Toxicology and/or Pharmacology (13.2)]. 3 in the placebo group. McCune-Albright Syndrome StudyA multi-center, single-arm, open-label study was conducted in 28 girls with McCune-Albright Syndrome and progressive precocious puberty aged 2 to <10 years. All patients received a 1 mg daily dose of Anastrozole Tablets. The trial duration was 12 months. Patients were enrolled on the basis of a diagnosis of typical (27/28) or atypical (1/27) McCune-Albright Syndrome, precocious puberty, history of vaginal bleeding, and/or advanced bone age. Patients’ baseline characteristics included the following: a mean chronological age of 5.9 ± 2.0 years, a mean bone age of 8.6 ± 2.6 years, a mean growth rate of 7.9 ± 2.9 cm/year and a mean Tanner stage for breast of 2.7 ± 0.81. Compared to pre-treatment data there were no on-treatment statistically significant reductions in the frequency of vaginal bleeding days, or in the rate of increase of bone age (defined as a ratio between the change in bone age over the change of chronological age). There were no clinically significant changes in Tanner staging, mean ovarian volume, mean uterine volume and mean predicted adult height. A small but statistically significant reduction of growth rate from 7.9 ± 2.9 cm/year to 6.5 ± 2.8 cm/year was observed but the absence of a control group precludes attribution of this effect to treatment or to other confounding factors such as variations in endogenous estrogen levels commonly seen in McCune-Albright Syndrome patients.Five patients (18%) experienced adverse reactions that were considered possibly related to Anastrozole Tablets. These were nausea, acne, pain in an extremity, increased alanine transaminase and aspartate transaminase, and allergic dermatitis.Pharmacokinetics in Pediatric PatientsFollowing 1 mg once daily multiple administration in pediatric patients, the mean time to reach the maximum anastrozole concentration was 1 hr. The mean (range) disposition parameters of anastrozole in pediatric patients were described by a CL/F of 1.54 L/h (0.77-4.53 L/h) and V/F of 98.4 L (50.7-330.0 L). The terminal elimination half-life was 46.8 h, which was similar to that observed in postmenopausal women treated with anastrozole for breast cancer. Based on a population pharmacokinetic analysis, the pharmacokinetics of anastrozole was similar in boys with pubertal gynecomastia and girls with McCune-Albright Syndrome. In studies 0030 and 0027, about 50% of patients were 65 or older. Patients ≥ 65 years of age had moderately better tumor response and time to tumor progression than patients < 65 years of age regardless of randomized treatment. In studies 0004 and 0005, 50% of patients were 65 or older. Response rates and time to progression were similar for the over 65 and younger patients.In the ATAC study, 45% of patients were 65 years of age or older. 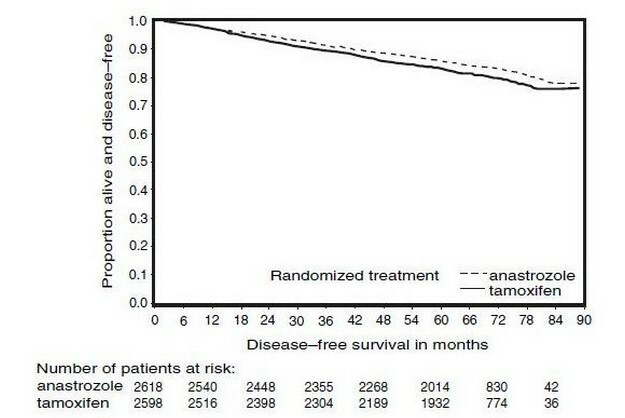 The efficacy of Anastrozole compared to tamoxifen in patients who were 65 years or older (N=1413 for Anastrozole and N=1410 for tamoxifen, the hazard ratio for disease-free survival was 0.93 [95% CI: 0.80, 1.08]) was less than efficacy observed in patients who were less than 65 years of age (N=1712 for Anastrozole and N=1706 for tamoxifen, the hazard ratio for disease-free survival was 0.79 [95% CI: 0.67, 0.94]).The pharmacokinetics of anastrozole are not affected by age. Clinical trials have been conducted with Anastrozole, up to 60 mg in a single dose given to healthy male volunteers and up to 10 mg daily given to postmenopausal women with advanced breast cancer; these dosages were tolerated. A single dose of Anastrozole that results in life-threatening symptoms has not been established. There is no specific antidote to overdosage and treatment must be symptomatic. In the management of an overdose, consider that multiple agents may have been taken. Vomiting may be induced if the patient is alert. Dialysis may be helpful because Anastrozole is not highly protein bound. General supportive care, including frequent monitoring of vital signs and close observation of the patient, is indicated. Anastrozole,USP is an off-white powder with a molecular weight of 293.4. Anastrozole,USP has moderate aqueous solubility (0.5 mg/mL at 25°C); solubility is independent of pH in the physiological range. Anastrozole, USP is freely soluble in methanol, acetone, ethanol, and tetrahydrofuran, and very soluble in acetonitrile.Each tablet contains as inactive ingredients: colloidal silicon dioxide, hypromellose, lactose monohydrate, magnesium stearate, microcrystalline cellulose, polyethylene glycol/macrogol sodium starch glycolate, and titanium dioxide . The growth of many cancers of the breast is stimulated or maintained by estrogens.In postmenopausal women, estrogens are mainly derived from the action of the aromatase enzyme, which converts adrenal androgens (primarily androstenedione and testosterone) to estrone and estradiol. The suppression of estrogen biosynthesis in peripheral tissues and in the cancer tissue itself can therefore be achieved by specifically inhibiting the aromatase enzyme.Anastrozole is a selective non-steroidal aromatase inhibitor. It significantly lowers serum estradiol concentrations and has no detectable effect on formation of adrenal corticosteroids or aldosterone. Mean serum concentrations of estradiol were evaluated in multiple daily dosing trials with 0.5, 1, 3, 5, and 10 mg of Anastrozole in postmenopausal women with advanced breast cancer. Clinically significant suppression of serum estradiol was seen with all doses. Doses of 1 mg and higher resulted in suppression of mean serum concentrations of estradiol to the lower limit of detection (3.7 pmol/L). The recommended daily dose, Anastrozole 1 mg, reduced estradiol by approximately 70% within 24 hours and by approximately 80% after 14 days of daily dosing. Suppression of serum estradiol was maintained for up to 6 days after cessation of daily dosing with Anastrozole 1 mg.The effect of Anastrozole in premenopausal women with early or advanced breast cancer has not been studied. Because aromatization of adrenal androgens is not a significant source of estradiol in premenopausal women, Anastrozole would not be expected to lower estradiol levels in premenopausal women. In multiple daily dosing trials with 5 and 10 mg, thyroid stimulating hormone (TSH) was measured; there was no increase in TSH during the administration of Anastrozole. Anastrozole does not possess direct progestogenic, androgenic, or estrogenic activity in animals, but does perturb the circulating levels of progesterone, androgens, and estrogens. max was delayed from 2 to 5 hours when anastrozole was administered 30 minutes after food. The pharmacokinetics of anastrozole are linear over the dose range of 1 to 20 mg, and do not change with repeated dosing. The pharmacokinetics of anastrozole were similar in patients and healthy volunteers. in vitro. Administration of a single 30 mg/kg or multiple 10 mg/kg doses of anastrozole to healthy subjects had no effect on the clearance of antipyrine or urinary recovery of antipyrine metabolites. 2 basis) for up to 2 years produced an increase in the incidence of benign ovarian stromal, epithelial and granulosa cell tumors at all dose levels. A dose-related increase in the incidence of ovarian hyperplasia was also observed in female mice. These ovarian changes are considered to be rodent-specific effects of aromatase inhibition and are of questionable significance to humans. The incidence of lymphosarcoma was increased in males and females at the high dose. At 50 mg/kg/day, plasma AUC levels in mice were 35 to 40 times higher than the level exhibited in postmenopausal volunteers at the recommended dose. 2 basis). Recovery of fertility was observed following a 5-week non-dosing period which followed 3 weeks of dosing. It is not known whether these effects observed in female rats are indicative of impaired fertility in humans. 0-24 hr that were 22 times and 16 times higher than the respective values found in postmenopausal women at the recommended dose). It is not known whether these effects on the reproductive organs of animals are associated with impaired fertility in premenopausal women. 2 basis), administered during the period of organogenesis showed that anastrozole increased pregnancy loss (increased pre- and/or post-implantation loss, increased resorption, and decreased numbers of live fetuses); effects were dose related in rats. Placental weights were significantly increased in rats at doses of 0.1 mg/kg/day or more. 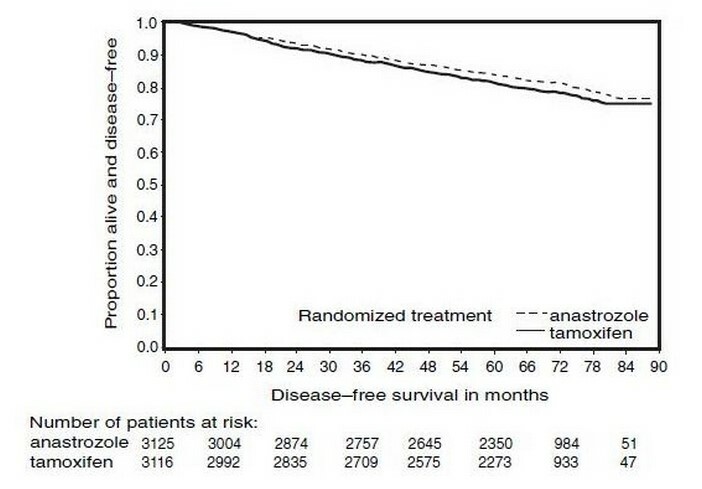 or Tamoxifen Monotherapy in the ATAC TrialThe survival data with 68 months follow-up is presented in Table 9.In the group of patients who had previous adjuvant chemotherapy (N=698 for Anastrozole and N=647 for tamoxifen), the hazard ratio for disease-free survival was 0.91 (95% CI: 0.73 to 1.13) in the Anastrozole arm compared to the tamoxifen arm.The frequency of individual events in the intent-to-treat population and the hormone receptor-positive subpopulation are described in Table 8.Table 8 - All Recurrence and Death Events*Intent-To-Treat Population‡Hormone Receptor-Positive Subpopulation‡Anastrozole1 mg(N†=3125)Tamoxifen20 mg(N†=3116)Anastrozole1 mg(N†=2618)Tamoxifen20 mg(N†=2598)Median Duration of Therapy (mo)60606060Median EfficacyFollow-up (mo)68686868Loco-regional recurrence119 (3.8)149 (4.8)76 (2.9)101 (3.9)Contralateral breast cancer35 (1.1)59 (1.9)26 (1.0)54 (2.1)Invasive27 (0.9)52 (1.7)21 (0.8)48 (1.8)Ductal carcinomain situ8 (0.3)6 (0.2)5 (0.2)5 (0.2)Unknown01 (<0.1)01 (<0.1)Distant recurrence324 (10.4)375 (12.0)226 (8.6)265 (10.2)Death from Any Cause411 (13.2)420 (13.5)296 (11.3)301 (11.6)Death breast cancer218 (7.0)248 (8.0)138 (5.3)160 (6.2)Death other reason(including unknown)193 (6.2)172 (5.5)158 (6.0)141 (5.4)*The combination arm was discontinued due to lack of efficacy benefit at 33 months of follow-up.†N=Number of patients randomized‡Patients may fall into more than one category.A summary of the study efficacy results is provided in Table 9.Table 9 - ATAC Efficacy Summary*Intent-To-Treat PopulationHormone Receptor-Positive SubpopulationAnastrozole1 mg(N=3125)Tamoxifen20 mg(N=3116)Anastrozole1 mg(N=2618)Tamoxifen20 mg(N=2598)Number of EventsNumber of EventsDisease-free Survival575651424497Hazard ratio0.870.832-sided95% CI0.78 to 0.970.73 to 0.94p-value0.01270.0049Distant Disease-free Survival500530370394Hazard ratio0.940.932-sided95% CI0.83 to 1.060.80 to 1.07Overall Survival411420296301Hazard ratio0.970.972-sided95% CI0.85 to 1.120.83 to 1.14*The combination arm was discontinued due to lack of efficacy benefit at 33 months of follow-up10-year median follow-up Efficacy Results from the ATAC TrialIn a subsequent analysis of the ATAC trial, patients in the two monotherapy arms were followed for a median of 120 months (10years). Patients received study treatment for a median of 60 months (5 years) (see Table 10).Table 10 - Efficacy SummaryIntent-To-Treat PopulationHormone Receptor-Positive SubpopulationAnastrozole1 mg(N=3125)Tamoxifen20 mg(N=3116)Anastrozole1 mg(N=2618)Tamoxifen20 mg(N=2598)Number of EventsNumber of EventsDisease-free Survival9531022735924Hazard ratio0.910.862-sided95% CI0.83 to 0.990.78 to 0.95p-value0.03650.0027Overall Survival734747563586Hazard ratio0.970.952-sided95% CI0.88 to 1.080.84 to 1.06Figure 3 - Disease-Free Survival Kaplan Meier Survival Curve for all Patients Randomized to Anastrozole or Tamoxifen Monotherapy in the ATAC Trial (Intent-to-Treat) (a)a The proportion of patients with 120 months’ follow-up was 29.4%. (b)bThe proportion of patients with 120 months’ follow-up was 29.8%. Two double-blind, controlled clinical studies of similar design (0030, a North American study and 0027, a predominately European study) were conducted to assess the efficacy of Anastrozole compared with tamoxifen as first-line therapy for hormone receptor positive or hormone receptor unknown locally advanced or metastatic breast cancer in postmenopausal women. A total of 1021 patients between the ages of 30 and 92 years old were randomized to receive trial treatment. 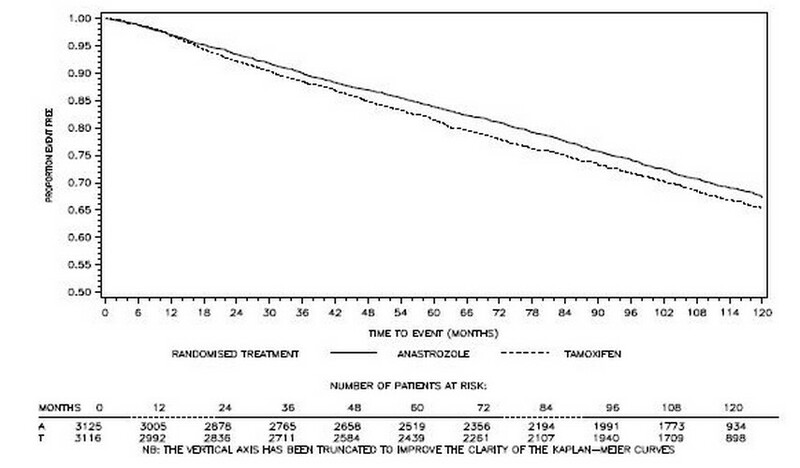 Patients were randomized to receive 1 mg of Anastrozole once daily or 20 mg of tamoxifen once daily. The primary endpoints for both trials were time to tumor progression, objective tumor response rate, and safety.Demographics and other baseline characteristics, including patients who had measurable and no measurable disease, patients who were given previous adjuvant therapy, the site of metastatic disease and ethnic origin were similar for the two treatment groups for both trials. The following table summarizes the hormone receptor status at entry for all randomized patients in trials 0030 and 0027.Table 11 — Demographic and Other Baseline CharacteristicsNumber (%) of subjectsTrial 0030Trial 0027Receptor statusAnastrozole1 mg(N=171)Tamoxifen20 mg(N=182)Anastrozole1 mg(N=340)Tamoxifen20 mg(N=328)ER* and/or PgR†151 (88.3)162 (89.0)154 (45.3)144 (43.9)ER* unknown, PgR† Unknown19 (11.1)20 (11.0)185 (54.4)183 (55.8)*ER=Estrogen receptor†PgR=Progesterone receptorFor the primary endpoints, trial 0030 showed that Anastrozole had a statistically significant advantage over tamoxifen (p=0.006) for time to tumor progression; objective tumor response rates were similar for Anastrozole and tamoxifen. 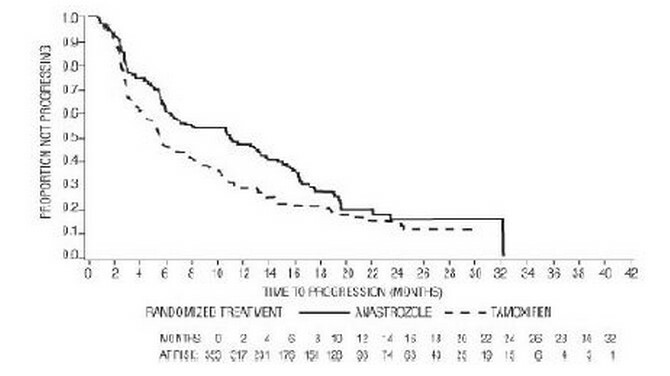 Trial 0027 showed that Anastrozole and tamoxifen had similar objective tumor response rates and time to tumor progression (see Table 12 and Figures 5 and 6).Table 12 below summarizes the results of trial 0030 and trial 0027 for the primary efficacy endpoints.Table 12 – Efficacy Results of First-line TreatmentEndpointTrial 0030Trial 0027Anastrozole1 mg(N=171)Tamoxifen20 mg(N=182)Anastrozole1 mg(N=340)Tamoxifen20 mg(N=328)Time to progression (TTP)Median TTP (months)11.15.68.28.3Number (%) of subjectsWho progressed114 (67%)138 (76%)249 (73%)247 (75%)Hazard ratio (LCL* )†1.42 (1.15)1.01 (0.87)2-sided 95% CI‡(1.11, 1.82)(0.85, 1.20)p-value§0.0060.920Best objective response rateNumber (%) of subjectsWith CR¶ + PR#36 (21.1%)31 (17.0%)112 (32.9%)107 (32.6%)Odds Ratio (LCL* )Þ1.30 (0.83)1.01 (0.77)*LCL=Lower Confidence Limit† Tamoxifen : Anastrozole‡ CI=Confidence Interval§ Two-sided Log Rank¶ CR=Complete Response# PR=Partial ResponseÞ Anastrozole : TamoxifenFigure 5 - Kaplan-Meier probability of time to disease progression for all randomized patients (intent-to-treat) in Trial 0030Figure 6 - Kaplan-Meier probability of time to progression for all randomized patients (intent-to-treat) in Trial 0027Results from the secondary endpoints were supportive of the results of the primary efficacy endpoints. There were too few deaths occurring across treatment groups of both trials to draw conclusions on overall survival differences. Anastrozole Tablets, USP 1mg are supplied in bottles of 30 tablets (NDC 69117-0003-1) and bottles of 1000 tablets (NDC 69117-0003-4). Store at 20°to 25°C (68°to 77°F) [see USP Controlled Room Temperature,]. Patients should be advised that Anastrozole may cause fetal harm. They should also be advised that Anastrozole is not for use in premenopausal women; therefore, if they become pregnant, they should stop taking Anastrozole and immediately contact their doctor. Patients should be informed of the possibility of serious allergic reactions with swelling of the face, lips, tongue and/or throat (angioedema) which may cause difficulty in swallowing and/or breathing and to seek medical attention immediately. Patients with pre-existing ischemic heart disease should be informed that an increased incidence of cardiovascular events has been observed with Anastrozole use compared to tamoxifen use. If patients have new or worsening chest pain or shortness of breath they should seek medical attention immediately. Patients should be informed that Anastrozole lowers the level of estrogen. This may lead to a loss of the mineral content of bones, which might decrease bone strength. A possible consequence of decreased mineral content of bones is an increase in the risk of fractures. Patients should be informed that an increased level of cholesterol might be seen while receiving Anastrozole. Patients should be informed that if they experience tickling, tingling, or numbness they should notify their helath care provider. Patients should be advised not to take Anastrozole with Tamoxifen. Anastrozole TabletsWhat is the most important information I should know aboutAnastrozole Tablets?Anastrozole Tablets may cause serious side effects including:heart disease. Women with early breast cancer, who have a history of blockage in their heart arteries (ischemic heart disease) and who take Anastrozole Tablets, may have an increase in symptoms of decreased blood flow to their heart compared to similar women who take tamoxifen. Tamoxifen. You should not take Anastrozole Tablets if you take tamoxifen. Taking Anastrozole Tablets with tamoxifen may lower the amount of Anastrozole Tablets in your blood and may cause Anastrozole Tablets not to work as well. Bone thinning or weakness (osteoporosis). Anastrozole Tablets lowers estrogen in your body, which may cause your bones to become thinner and weaker. This may increase your risk of fractures, especially of your spine, hip and wrist. Your doctor may order a bone mineral density test before you start and during treatment with Anastrozole Tablets to check you for bone changes. Increased blood cholesterol (fat in the blood). Your doctor may do blood tests to check your cholesterol while you are taking Anastrozole Tablets. Skin reactions. Stop taking Anastrozole Tablets and call your doctor right away if you get any skin lesions, ulcers, or blisters. Swelling of your face, lips, tongue, or throattrouble swallowing or breathingliver problems. Anastrozole Tablets can cause inflammation of your liver and changes in liver function blood tests. Your doctor may check you for this. Inactive ingredients: Lactose Monohydrate, magnesium stearate, Microcrystalline Cellulose, Colloidal Silicon Dioxide, Sodium Starch Glycolate, Hypromellose, Titanium Dioxide, Polyethylene Glycol/Macrogol.. Manufactured By:Beijing Yiling Bio-engineering Technology Ltd.